My wife and I love small cruise ships. We prefer a “country club casual” dress code; great food and service; and an intimate vessel that makes it easy to meet new and interesting fellow travelers. We’ve cruised on Windstar and several other small-ship ocean cruise lines many times, as well as on river cruises in Europe, the U.S., and the Amazon. I’ve been intrigued by SeaDream for several years, and this year we finally took the plunge on a 7-day Caribbean winter-getaway cruise from Barbados to St. Thomas. We’re glad we did! Embarkation: Getting to - and on – a ship at the beginning of a voyage is often one of the most stressful, frustrating parts of a cruise. Embarkation on SeaDream was easy and seamless. We arrived portside about an hour before boarding was to start. SeaDream had port agents there to take our luggage and free us to wander Bridgetown unencumbered at our leisure. At the designated 2:00 pm time, we caught the shuttle to the ship, were welcomed aboard with champagne and a lovely buffet, and quickly and efficiently went through the registration process. It couldn’t have been easier. Disembarkation was just as easy, albeit a little sadder. The Ship: SeaDream is a tiny, all-inclusive, boutique cruise line, consisting of two, thirty-year-old ships, (cleverly named SeaDream I and SeaDream II). These identical, very well-maintained ships each carry about 110 passengers and 96 crew members. The ship has a small pool and hot tub, plenty of lounge chairs and lots of shaded nooks and crannies to curl up with a good book. There are several bars around the ship, with convivial bartenders eager to keep passengers well-lubricated. SeaDream has a very loyal clientele. Half or more of the passengers had sailed on SeaDream before; often many times. One couple had spent 311 days on SeaDream ships. It doesn’t get much more loyal than that. Dining: The food on SeaDream II was superb! (Thank you, Alastair!!) There was always a seafood dish on the menu, plus a variety of entres. I don’t eat tofu, but there also appeared to be plenty of tasty options for non-carnivores. The main dining room on Deck 2 is lovely, but most evenings (weather permitting) dinner was alfresco at the Topside Restaurant on Decks 5 and 6. Pre-dinner cocktails were served in the lounge or poolside, and always included a wonderful assortment of hors d’oeuvres. Cabins: The cabins on SeaDream are adequate in size ( 195 sq. ft.), nicely appointed and well layed out, but there are no verandas. The bathroom is quite small. You actually have to sit side-saddle to use the throne. The shower, however, is decent-sized, and water pressure is good. On-Board Activities: There are no Broadway shows, water slides or midnight buffets on SeaDream II. During the day, the sports platform is out for swimming, sunning and enjoying an assortment of water toys (both motorized and non-motorized). The two jet-skis were great fun, (however, after riding in choppy water I quickly learned how my dog must have felt when I had him neutered). The piano bar on Deck 4 was a fun place to be after 9:30 pm. Fred is a marvelous piano player and loved to accompany us in ad hoc karaoke. Across from the piano is a tiny “casino” consisting of a single blackjack table at which Alexandra is always “feeling very generous”. Bartender Severin happily and efficiently kept us all well lubricated. SeaDream did a great job helping my wife celebrate her birthday. At dinner they served her a beautiful - and tasty - personalized cake, and everyone, of course, sang “Happy Birthday”. On a ship this size, (we had only 88 passengers on board), most everyone already knew her and came up afterwards to wish her a happy day. And when we returned to our cabin, we found it festively decorated with balloons and towel animals. We were very pleased. The Crew: The SeaDream staff came from all over the world: Phillipines, Thailand, South Africa, Hungary, Croatia, Norway, etc., etc. They were all outstanding. They were fun, funny, efficient and attentive, and knew our names by the second day. I worry about naming a few names because so many wonderful crew members will be left out. But among the folks who made this voyage so memorable are Nikola the maitre d’, Frank the sommelier, Eugene, Fernando and Alfie in the dining room and Tonya, the masseuse. On a somewhat negative note, we wish there had been more opportunity to mingle and talk with the Captain and senior crew. We first saw the Captain at the reception Sunday night, and then again when we disembarked a week later. But never in between. On a small ship like this, we’d prefer that the Captain not be invisible. 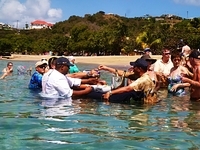 Other Activities and Issues: SeaDream’s much-touted “Caviar and Champagne Splash” and beach party easily lived up to the hype. It was a hoot!!! Everyone – passengers and crew alike – was eating and drinking and smiling and laughing. Where else can you wade into surf to be served caviar and champagne from a surfboard? The setting was perfect. A beautiful stretch of beach with plenty of chairs, a wonderful buffet and a well-stocked bar. With fewer than 100 passengers, the beach was never crowded. You could lay out in the sun, or in the shade of a palm tree, and relax and enjoy. It was a wonderful day SeaDream provides each passenger personalized pajamas with names embroidered in the shirt. We understood that the pajamas were “one size fits all”. That works for me, but my wife is less than 100 pounds soaking wet. Three months before the cruise, I asked SeaDream if they could provide my wife pajamas in an XS. No dice! Her lovely, personalized pajamas were Extra Large and useless to her. We threw them in the trash. What a waste. SeaDream’s much-touted “Sleeping under the stars in a Balinese Bed” was very disappointing. We took the advice from SeaDream reviews and were among the very first passengers to board the ship. We immediately reserved the most secluded and private of the Balinese beds (on the bow of Deck 6) for my wife’s birthday later in the week. When that day arrived, there was no communication from SeaDream reminding us or providing guidance on how best to take advantage of the experience. We also discovered that the only way to get to that Balinese bed was to traipse through a crowd of passengers in the Topside Bar. The above-mentioned pajama issue was also an obstacle to enjoying the Balinese bed. As a result of all this, we visited our Balinese bed after dinner, sat under the stars for an hour or so, and then returned to our cabin to go to bed. It should have been more fun and memorable than that. As is the case with most cruise lines, excursions booked through SeaDream are expensive and a bit of a crap shoot. We took only one excursion all week, a disappointing Catamaran and Snorkeling adventure. The sailing part was scenic and enjoyable, (it was a lovely, spacious boat), but the snorkeling was a waste of time. For the even more-expensive ($159 pp) “Tropical Eco-Adventure by Zodiac”, we fortunately never got off the wait list. Friends who took this excursion said it was awful. Instead, that day, we visited the amazing Deshaies, Guadelupe, Botanical Garden. A beautiful place well worth three hours of our time.!! We could have taken the SeaDream excursion to the Gardens for $79 per person. Instead, we took the tender into town and looked for a cab. By pure luck, we discovered there was a free shuttle to the nearby gardens. Perfect!! We paid our $16 pp admission and had a great time, while saving a total of about $125 in the process. 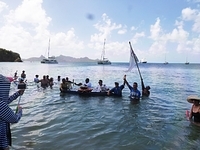 Afterwards, the concierge on SeaDream claimed to know nothing about the free shuttle. A word of warning to those prone to sea-sickness. This is a small, older ship configured with less-than-state-of-the-art stabilization. A couple of times we sailed all night in choppy waters, and the SeaDream II was rocking and rolling a lot. We found it soothing and relaxing; but some motion-sensitive passengers may not. I don’t want to overstate the negatives on this cruise. For the most part, they are little nit-picking things that could easily be fixed or simply ignored. Overall, it was a wonderful experience, and a marvelous relaxing week. I expect that we will be back on board a SeaDream cruise again in the not too far distant future. My wife and I love small cruise ships. We prefer a “country club casual” dress code; great food and service; and an intimate vessel that makes it easy to meet new and interesting fellow travelers. We’ve cruised on Windstar and several other small-ship ocean cruise lines many times, as well as on river cruises in Europe, the U.S., and the Amazon. I’ve been intrigued by SeaDream for several years, and this year we finally took the plunge on a 7-day Caribbean winter-getaway cruise from Barbados to St. Thomas. We’re glad we did! Embarkation: Getting to - and on – a ship at the beginning of a voyage is often one of the most stressful, frustrating parts of a cruise. Embarkation on SeaDream was easy and seamless. We arrived portside about an hour before boarding was to start. SeaDream had port agents there to take our luggage and free us to wander Bridgetown unencumbered at our leisure. At the designated 2:00 pm time, we caught the shuttle to the ship, were welcomed aboard with champagne and a lovely buffet, and quickly and efficiently went through the registration process. It couldn’t have been easier. Disembarkation was just as easy, albeit a little sadder. The Ship: SeaDream is a tiny, all-inclusive, boutique cruise line, consisting of two, thirty-year-old ships, (cleverly named SeaDream I and SeaDream II). These identical, very well-maintained ships each carry about 110 passengers and 96 crew members. The ship has a small pool and hot tub, plenty of lounge chairs and lots of shaded nooks and crannies to curl up with a good book. There are several bars around the ship, with convivial bartenders eager to keep passengers well-lubricated. SeaDream has a very loyal clientele. Half or more of the passengers had sailed on SeaDream before; often many times. One couple had spent 311 days on SeaDream ships. It doesn’t get much more loyal than that. Dining: The food on SeaDream II was superb! (Thank you, Alastair!!) There was always a seafood dish on the menu, plus a variety of entres. I don’t eat tofu, but there also appeared to be plenty of tasty options for non-carnivores. The main dining room on Deck 2 is lovely, but most evenings (weather permitting) dinner was alfresco at the Topside Restaurant on Decks 5 and 6. Pre-dinner cocktails were served in the lounge or poolside, and always included a wonderful assortment of hors d’oeuvres. Cabins: The cabins on SeaDream are adequate in size ( 195 sq. ft.), nicely appointed and well layed out, but there are no verandas. The bathroom is quite small. You actually have to sit side-saddle to use the throne. The shower, however, is decent-sized, and water pressure is good. On-Board Activities: There are no Broadway shows, water slides or midnight buffets on SeaDream II. During the day, the sports platform is out for swimming, sunning and enjoying an assortment of water toys (both motorized and non-motorized). The two jet-skis were great fun, (however, after riding in choppy water I quickly learned how my dog must have felt when I had him neutered). The piano bar on Deck 4 was a fun place to be after 9:30 pm. Fred is a marvelous piano player and loved to accompany us in ad hoc karaoke. Across from the piano is a tiny “casino” consisting of a single blackjack table at which Alexandra is always “feeling very generous”. Bartender Severin happily and efficiently kept us all well lubricated. SeaDream did a great job helping my wife celebrate her birthday. At dinner they served her a beautiful - and tasty - personalized cake, and everyone, of course, sang “Happy Birthday”. On a ship this size, (we had only 88 passengers on board), most everyone already knew her and came up afterwards to wish her a happy day. And when we returned to our cabin, we found it festively decorated with balloons and towel animals. We were very pleased. The Crew: The SeaDream staff came from all over the world: Phillipines, Thailand, South Africa, Hungary, Croatia, Norway, etc., etc. They were all outstanding. They were fun, funny, efficient and attentive, and knew our names by the second day. I worry about naming a few names because so many wonderful crew members will be left out. But among the folks who made this voyage so memorable are Nikola the maitre d’, Frank the sommelier, Eugene, Fernando and Alfie in the dining room and Tonya, the masseuse. On a somewhat negative note, we wish there had been more opportunity to mingle and talk with the Captain and senior crew. We first saw the Captain at the reception Sunday night, and then again when we disembarked a week later. But never in between. On a small ship like this, we’d prefer that the Captain not be invisible. SeaDream provides each passenger personalized pajamas with names embroidered in the shirt. We understood that the pajamas were “one size fits all”. That works for me, but my wife is less than 100 pounds soaking wet. Three months before the cruise, I asked SeaDream if they could provide my wife pajamas in an XS. No dice! Her lovely, personalized pajamas were Extra Large and useless to her. We threw them in the trash. What a waste. SeaDream’s much-touted “Sleeping under the stars in a Balinese Bed” was very disappointing. We took the advice from SeaDream reviews and were among the very first passengers to board the ship. We immediately reserved the most secluded and private of the Balinese beds (on the bow of Deck 6) for my wife’s birthday later in the week. When that day arrived, there was no communication from SeaDream reminding us or providing guidance on how best to take advantage of the experience. We also discovered that the only way to get to that Balinese bed was to traipse through a crowd of passengers in the Topside Bar. The above-mentioned pajama issue was also an obstacle to enjoying the Balinese bed. As a result of all this, we visited our Balinese bed after dinner, sat under the stars for an hour or so, and then returned to our cabin to go to bed. It should have been more fun and memorable than that. As is the case with most cruise lines, excursions booked through SeaDream are expensive and a bit of a crap shoot. We took only one excursion all week, a disappointing Catamaran and Snorkeling adventure. The sailing part was scenic and enjoyable, (it was a lovely, spacious boat), but the snorkeling was a waste of time. For the even more-expensive ($159 pp) “Tropical Eco-Adventure by Zodiac”, we fortunately never got off the wait list. Friends who took this excursion said it was awful. Instead, that day, we visited the amazing Deshaies, Guadelupe, Botanical Garden. A beautiful place well worth three hours of our time.!! We could have taken the SeaDream excursion to the Gardens for $79 per person. Instead, we took the tender into town and looked for a cab. By pure luck, we discovered there was a free shuttle to the nearby gardens. Perfect!! We paid our $16 pp admission and had a great time, while saving a total of about $125 in the process. Afterwards, the concierge on SeaDream claimed to know nothing about the free shuttle. A word of warning to those prone to sea-sickness. This is a small, older ship configured with less-than-state-of-the-art stabilization. A couple of times we sailed all night in choppy waters, and the SeaDream II was rocking and rolling a lot. We found it soothing and relaxing; but some motion-sensitive passengers may not. I don’t want to overstate the negatives on this cruise. For the most part, they are little nit-picking things that could easily be fixed or simply ignored. Overall, it was a wonderful experience, and a marvelous relaxing week. I expect that we will be back on board a SeaDream cruise again in the not too far distant future.